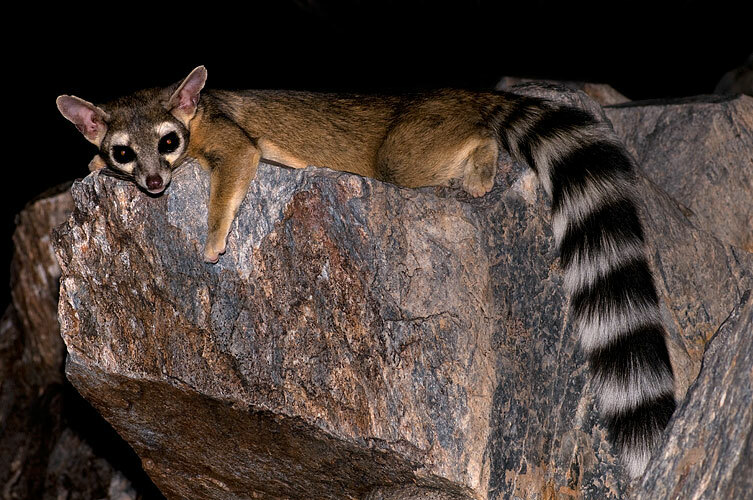 Ring-tailed Cats are a nocturnal species of mammal found throughout the Southwestern deserts. They use their cat-like agility to hunt insects and small vertebrates, but as omnivores they also eat fruit when available. They are said to be tamed easily and were even kept as pets by miners and early settlers to rid their house of mice and pests in the past. Like all foxes, the Gray fox is an omnivore. However, unlike the other species of the dog family, the Gray fox is the only one that can climb trees! Using its long, hooked claws for traction, and its long, bushy tail and strong powerful legs for balance, the Gray fox climbs trees to escape from predators. This species of owl isn’t very flighty which allows people to walk up pretty close (which makes for great pictures!). They hunt at night by scanning the floor for prey and then dropping down on it to kill and eat it. Even though they are fairly large (reaching heights up to a foot and a half), they are the smallest of the spotted owl subspecies and can be preyed upon by other, larger owls. Northern Aplomado Falcons are endangered in the state of Texas, but are currently in the process of being reintroduced. These falcons can reach a height of up to a foot and a half and a wingspan of up to three feet. They hunt in pairs and can prey on animals half their size, although female falcons have been recorded hunting birds larger than they are! Say hello to the state reptile of Texas! The Texas Horned Lizard is a calm and gentle species, and its intimidating appearance is mainly for defense. When threatened, they puff up so that their spikes protrude more, making them a not so friendly snack. If that doesn’t scare off predators, they can shoot a stream of not-so-tasty blood out of their eyes up to five feet away! The Chihuahuan Desert Lyre Snake is mostly nocturnal, although they do tend to come out when humidity levels are high (i.e. during the rainy season). Unlike other snakes, they can withstand low temperatures and they cannot inject pressurized venom into their prey. Instead, toxic saliva is deposited into the bite wound. This, along with their reluctance to bite, makes them less dangerous to people…good for us! It may be the state amphibian of Kansas, but the Barred Tiger Salamander is present in West Texas, too! These salamanders are highly adaptable to their environment. They can maintain their juvenile appearance (gills and a tail fin) when they mature if water is always present, or they can change into their adult form on demand (if there is no water available). The Rio Grande Leopard Frog is primarily nocturnal, but can also be seen during the day. It is an aquatic species and can be found in many permanent water sources throughout West Texas. The male frogs make a distinctive call that is loud enough to be heard a quarter of a mile or more away! The Striped Bark Scorpion can be found throughout the United States. Although their name implies that they can be found on trees, they are more commonly seen on the ground hiding under rocks or other ground debris. Unfortunately, this means that they are commonly encountered by people. Don’t worry, their sting is not deadly, but it can be extremely painful. Wolf Spiders are a nocturnal species, which may account for their excellent eyesight. In fact, there are only two other species of spiders that have better eyesight. Wolf Spiders are also unique in the way that they care for their young. The mother will attach her egg sac onto the bottom of her abdomen, and when hatched, the baby spiders will ride on top. A native of the Chihuahuan Desert, Ocotillo can reach heights of up to 20 feet! Their spiny stems make Ocotillo a popular plant to use as a natural fence. Although they look dry and barren most of the time, leaves appear soon after rain and their red blossoms appear from March through June. Although their long, thin, red flowers attract hummingbirds, bees are their primary pollinator. The Mexican Gold Poppy is considered a local treasure of El Paso. They are abundant in the Castner Range area and provide a beautiful, colorful landscape. Although they are considered poisonous, especially for small children, the Mexican Gold Poppy has been used in medicine since the time of the Aztecs. Its uses range from a relaxant and painkiller to an antimicrobial.